The best way to improve the enjoyment you are going to get out of your whole golf game is to develop your basic swing technique. It is an investment worth making. It will quite literally pay off on almost every shot you hit. If you see a measure of your enjoyment being how many good shots you hit; or for the very best players: how few bad shots you hit; then improve your swing. For us, as coaches, the challenge is not to put you all in the same grip, or reach the same point at the top, or get you on the same swing plane. It is to get your club face to the point, on a consistent basis, where it can make solid contact with the golf ball creating a positive and accurate ball flight. 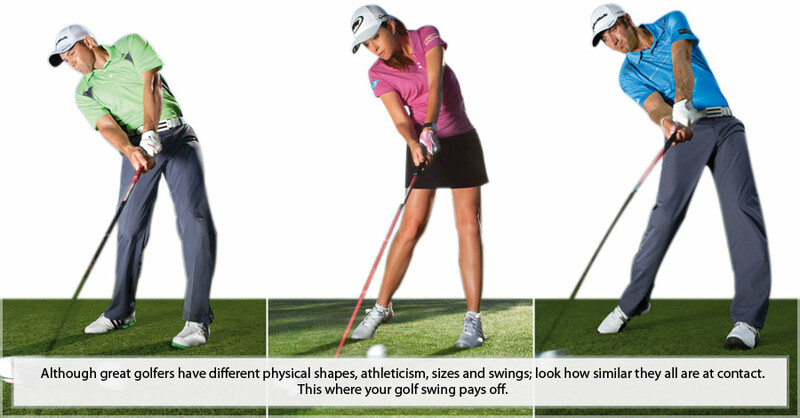 The contact zone is quite literally where it all pays off in your golf swing. Everything that went before that was a supporting act to deliver that club face back on YOUR swing path to the golf ball in a way that will deliver improved accuracy. I would also like to add that we can add significant distance to your shots (including your tee shots) just by making sure that you strike the golf ball off a good swing path and angle of attack, with your hands releasing the club through the contact zone. Think about how you strike a #6 Iron approach to the green. A faster swing speed golfer, who hits down and through the golf ball (with a solid contact), will generate a different ball flight and spin, than a golfer of the same swing speed who sweeps the ball away. Now change swing speed and the difference is greater. Now take the same golfer repeating the same swing, and let them play different model golf balls and each will perform quite differently with respect to the trajectory, height and spin rate. That means each will perform differently as they hit the green. Different golf balls, different swings. We need to help you find the match for your golf game. Last week I talked about how different golf balls respond differently off the Driver. Just selecting the golf ball that goes the furthest without thinking of the performance you need on approach shots is a little short-sighted. This entry was posted in golf, golf instruction, golf tips, sports and tagged accurate ball, contact zone, golf instruction, golf plane, golf practice, golf slice, golf swing, golf tips, swing path, swing plane, swing speed, swing technique. Bookmark the permalink.